Heat oven to 375°F. In 12-inch ovenproof nonstick skillet, melt butter over medium-high heat until sizzling. Add carrots and onion; cook 3 to 4 minutes, stirring occasionally, until vegetables are softened. Reduce heat to medium. Sprinkle flour over vegetables; cook and stir until flour is golden brown. Slowly stir in broth with spoon (wooden or nylon). Add bell pepper and ground red pepper. Cook 4 to 5 minutes, stirring occasionally, until thickened. 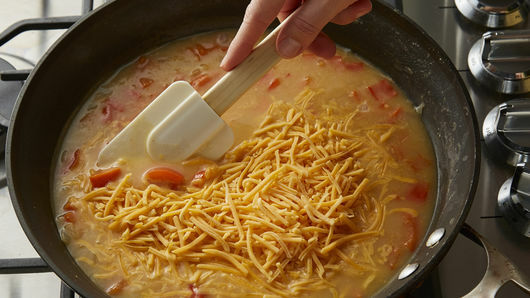 Stir in chicken and cheese. Cook and stir until cheese is melted. Remove from heat; cover and keep warm. Unroll dough on lightly floured work surface so short side of rectangle is pointed downward. 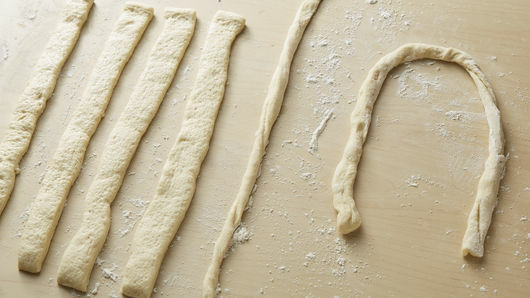 Cut dough lengthwise into 8 equal 12-inch strips. 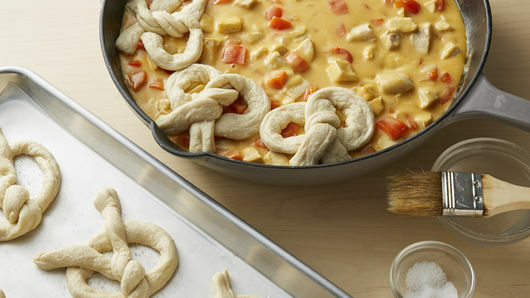 To make pretzel shape, roll each strip into about 20-inch rope; form dough into U shape. Twist ends together three times. Press down dough where dough overlaps in an X. Pick ends up, and fold over so they rest over bottom on U shape, pressing ends to stick. Place pretzels on cookie sheet lined with waxed paper. In small microwavable bowl, microwave 1/4 cup water uncovered on High 30 to 60 seconds or until very hot but not boiling. Add baking soda; stir until dissolved. 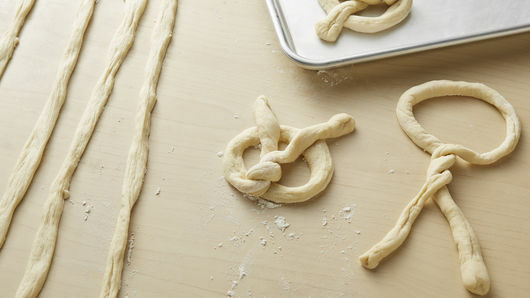 Brush pretzels with soda mixture (not all soda mixture will be used). Sprinkle tops of pretzels evenly with salt. 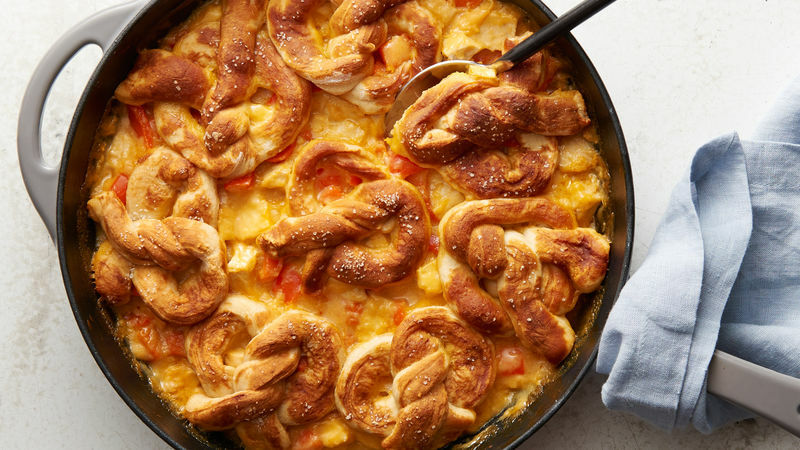 Place pretzels on top of filling in skillet. Bake 19 to 22 minutes or until pretzels are dark golden brown and filling is bubbling. Let stand 10 minutes before serving. Increase ground red pepper in filling for even more of a kick! Pretzels get their delicious, dark brown crust from being poached or brushed in a high-Ph solution, and in this case, it’s the baking soda added to the water.